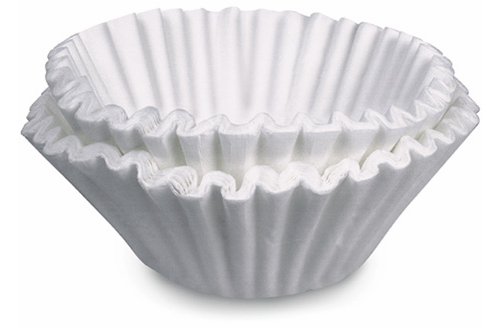 Behold, the humble coffee filter. Durable, cheap, lint-free, and you’ve probably already got them in your kitchen. If you don’t, you should get some — even if you don’t drink coffee. Why? Cover food in the microwave. Filter broken cork out of wine. Weigh bulk foods. Put the filter on your scale before adding herbs, flour or sugar. Make an herb sachet to place in soup. And how about some non-food uses? Put between fine china plates when storing to prevent scratches. Place in a cast-iron skillet to absorb moisture and prevent rust. Wrap Christmas ornaments for storage. Line plant pots before adding soil to keep it from leaking out the drain holes. Sprout seeds. Wrap the seeds in the filter, moisten it, place in a plastic bag until they sprout. Blotting paper for pressed flowers. Cleaning windows, mirrors and chrome. Holding tacos and other messy finger foods. They’re also pretty useful for making coffee.